While the typical cookbook format gives you a recipe for obvious success it does not take into account the many ways in which its execution can fail due to the cook's lack of experience. 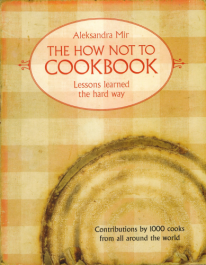 Based on Aleksandra's personal history of cooking disasters, the project invites 1000 people from all around the world to give their advice of how NOT to cook. With this volume, any reader will be more than well equipped to avoid making the same mistakes in their kitchen. For example... "Never EVER try to figure out if you turned on the hotplate by laying your hand on it. The police may wonder why you do not have fingerprints anymore."